The Dmitry Pokrovsky Ensemble was founded by prominest musician, scientist and researcher of Russian national culture Dmitry Pokrovsky(1944-1996) in Moscow in 1973 as a «living laboratory» for the study of different Russian folk traditions. The Ensemble was the first group of professional musicians who performed the folk music in authentic village styles at the academic scene. To learn the essence of the village music, Ensemble's members have traveled the length and breadth of rural Russia, documenting and studying to perform themselves the music traditions they encountered. 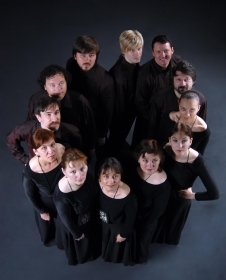 The special vocal school of Ensemble based on various styles of traditional Russian singing is absolutely unique. It is difficult to find now another collective of singers that can conquer the audience with their original interpretation of classic and avant-garde musical compositions, having a large repertoire of Russian village music of different traditions and styles. The Ensemble had been performing modern music, working together with many modern composers and at the same time having classical compositions in its repertoire. Having introduced western audiences to Russian traditional and modern music, the Ensemble has become a figure of world music culture.